Engine running, brakes not applied. Vacuum from the inlet manifold is applied to the front of the main diaphragm, but also though the passage in the air-valve diaphragm, gap between the diaphragm and the air valve, the bypass pipe, to the back of the diaphragm. 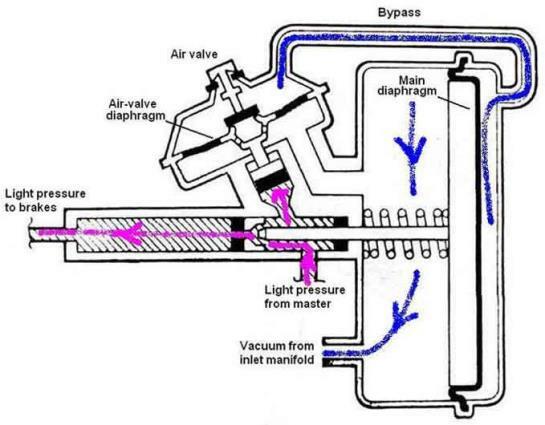 Thus the diaphragm has the same air pressure both sides and the return spring keeps it pressed to the back of the vacuum chamber. Brakes applied lightly. 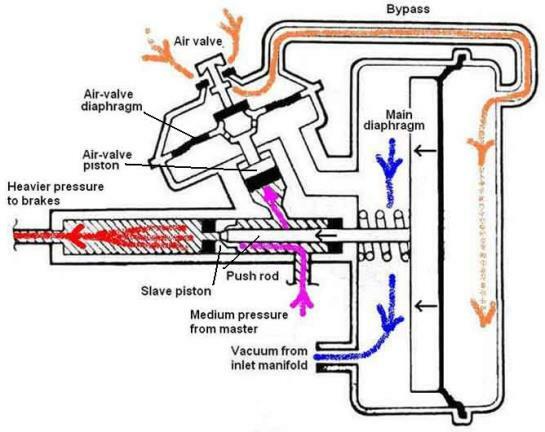 Light fluid pressure from the master is applied to the bottom of the air-valve diaphragm, and also through the space between the push-rod and the slave cylinder ands onward to the brakes. Light pressure on the air-valve piston pushes the air-valve diaphragm up to the air valve, closing off the gap between the two, but not yet lifting the air-valve off its seat. Thus there is still the same air pressure both sides of the diaphragm and it remains pressed to the back of the vacuum chamber. This lack of assistance on light pedal pressure prevents the brakes coming on harder and more suddenly than one might wish. Heavier pressure on brake pedal. Heavier fluid pressure pushes the air-valve piston and its diaphragm further, which lifts the air-valve off its seat. 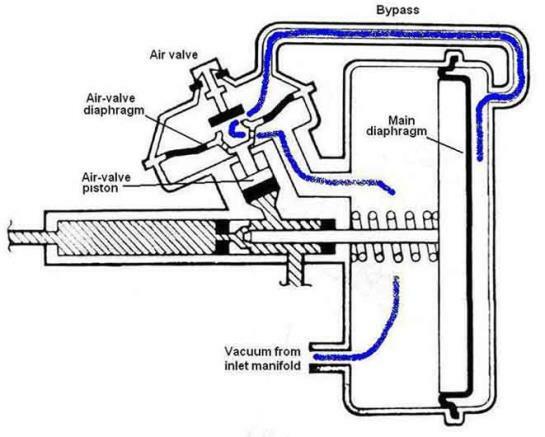 This opens the air-valve allowing air at atmospheric pressure through the bypass pipe to the back of the diaphragm. With a depression on the other side the diaphragm is pulled forward, together with the push-rod, which closes off the gap between it and the slave piston, and pushes the slave piston along the bore to give a higher pressure at the outlet to the brakes than there is on the inlet from the master cylinder, which gives the 'boost' effect. 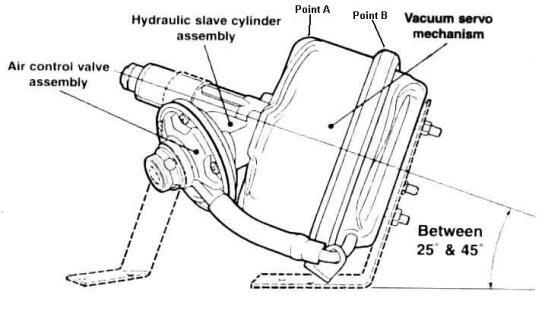 When the brake pedal is released, pressure on the air-valve piston is removed, it drops back, allowing its diaphragm and air valve to drop back also, and the latter closes the opening to the atmosphere. When the air-valve diaphragm moves away from the air valve the gap between them is opened up also, and manifold vacuum can now be applied via the bypass pipe to the back of the diaphragm again. This moves back to the rear of the chamber, pulling the push-rod back. The push-rod is connected to the slave piston with a loose connection (not shown in the diagram) so as well as opening up the gap between the two and releasing pressure from the brakes, it also pulls the slave piston back. Note that as the servo releases a small amount of air passes from the back of the diaphragm into the inlet manifold. Some report that, with rapid and repeated presses of the brake pedal, the idle revs will rise. I don't get that, instead I will get a slight drop in idle speed during warm-up, which takes more and more presses as it warms up, until eventually it doesn't alter the revs at all at full operating temperature. Note also that if the revs rise and stay risen while the brake pedal is held down, that does indicate a servo fault, whereby the air-valve is opening but the bypass isn't being closed off. There is a one-way valve where the vacuum hose attaches to the servo, which ensures vacuum remains in the servo if the engine should stop while the vehicle is in motion - note that if the momentum of the car is still spinning the engine vacuum will still be maintained in the inlet manifold and hence the servo. However this will NOT occur if the throttle is held wide open, even if the engine is still spinning. While there is vacuum remaining in the servo the brakes will function normally i.e. with the usual amount of assistance, and it will take two or three presses of the pedal to 'empty' that vacuum. So another thing to remember is not to pump the brakes if the engine stops while moving ... to be counter-balanced by the possible need for cadence braking if the front wheels should lock! 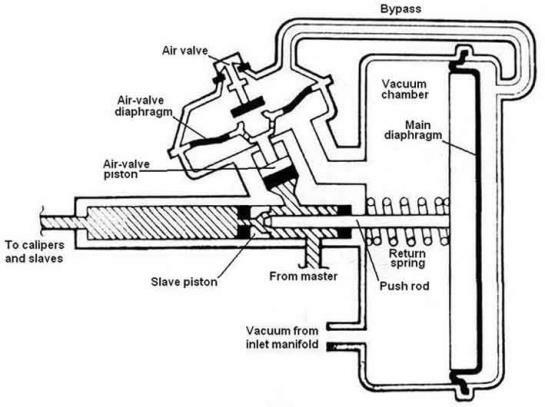 Image from AP/Lockheed fitting instructions (this link downloads a PDF) found on a Lotus Elan forum showing a pronounced upward angle of the cylinder, and the air-valve assembly pointing downwards, both of which will reduce the amount of air that can be trapped in the servo. But whether there is enough room to tilt the servo in an MGB by 45 degrees, or even 25 degrees, I don't know, as it is already pretty-well sandwiched between the bonnet and the shelf as it is. It could be tilted by about 10 degrees before point A rises above point B and so needs more vertical space, and once you start tilting it there is scope to move the whole servo down on the main bracket, so reducing the vertical space required.